Many fabricators that have upgraded their laser cutting from CO2 to fiber are finding the newly acquired cutting speeds can be hard to keep up with. Sounds like a good problem to have, right? Well, for some, it can cause serious headaches where downstream operations are concerned. Depending on the material and material thickness, the increase in cutting speeds from CO2 to fiber can be as high as 300 percent. The result is a pile of parts waiting their turn for the press brake or a shop owner faced with investing in a fleet of brakes to keep up with the fiber laser’s additional throughput. For shop owners that can’t afford more press brakes or don’t have the available floor space for additional machines, the solution might be as straightforward as looking into new press brake technology. Today’s parts can be more complex, which calls for multi-axis backgauge bending, like the type from LVD Strippit shown here. Joe Malek, president of Condor Technology Services, has been around the fabricating block and then some. He remembers the days when laser cutters were in their infancy – when fiber lasers were yet to be discovered. As the industry changed and matured, Malek was there, watching and learning how to best take advantage of one of the greatest developments in metals processing. For those shops where more press brakes are not an option, Malek’s statement provides a sigh of relief. But it also comes with a laundry list of questions as to how one press brake can keep up with the lightening-fast cutting rates of a new fiber laser. To address those concerns, Malek shared an experience he’d had with a customer who had not just one, but four press brakes that were creating a bottleneck in his shop. When a press brake features hydraulic clamping and tooling, such as those produced by Wila USA, machine operators can set up jobs faster. This leads to more parts produced and less chances of creating a bottleneck at the machine. For a press brake to stay on pace with a new fiber laser, it needs a certain level of modern capabilities. Some of these technologies can be added to an existing machine while others, such as offline programming, can exist separate from the machine. 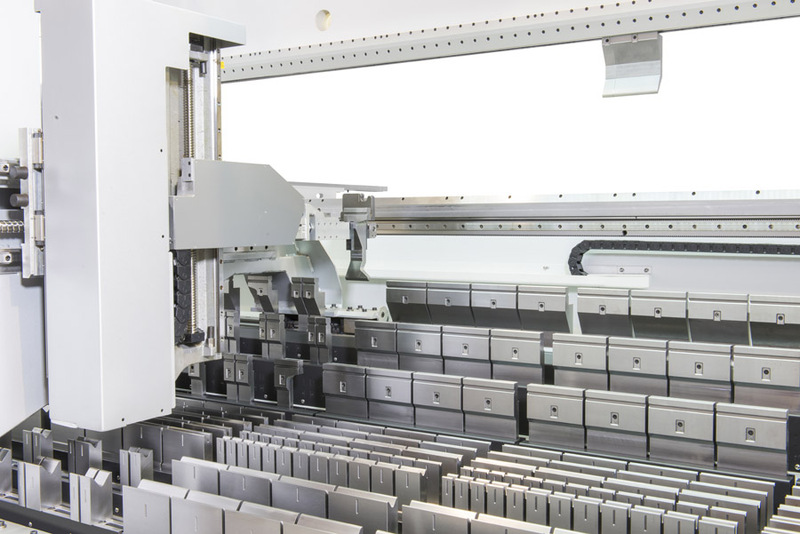 In some cases, a pre-existing press brake may have to be retired to make room for a new model. When Malek is working with customers, he is trying to help them find the most practical, affordable solution to their bottleneck issues. Unsurprisingly, every shop requires its own customized solution. Before formulating a solution, it’s helpful to know the options that are available for improving press brake productivity. 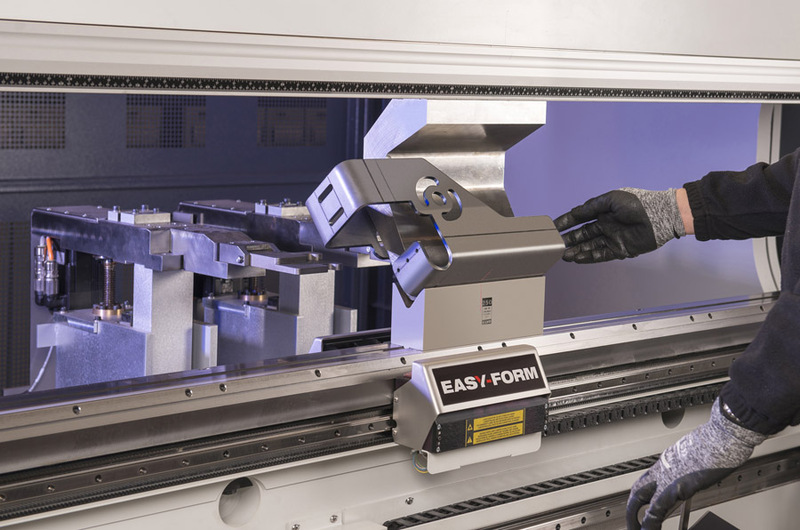 Laser angle measuring systems, such as EasyForm Laser developed at LVD Strippit, help press brake operators process accurate parts the first time. Offline programming: Not all productivity enhancers need to happen at the press brake where the bending is taking place. Activities such as offline programming can be an easy, fast and accurate way to increase the throughput available from a machine. Most likely, a shop is already programming the part for a punch or laser, so why reprogram the same part on the press brake control, which only takes time away from bending parts? 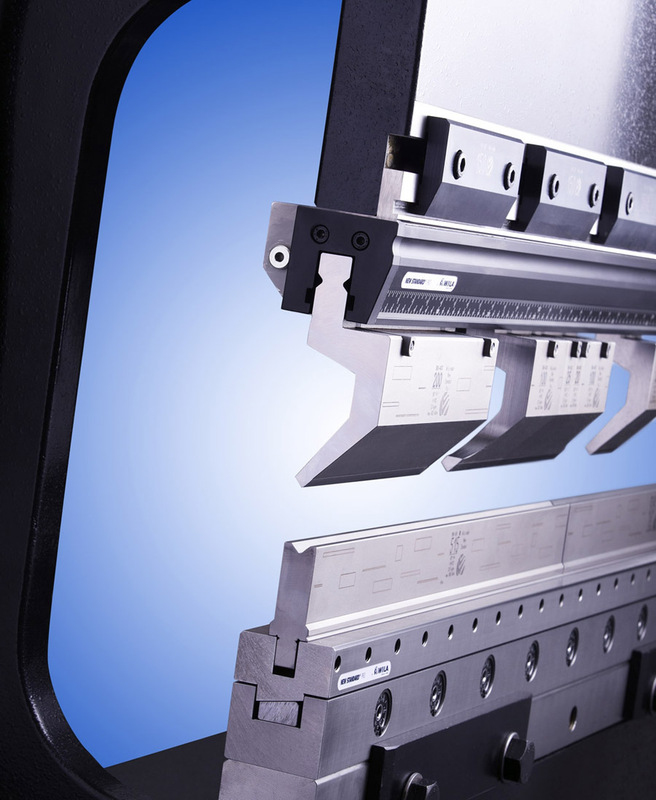 Most press brake manufacturers offer their own offline programming that is exclusive to their brands. 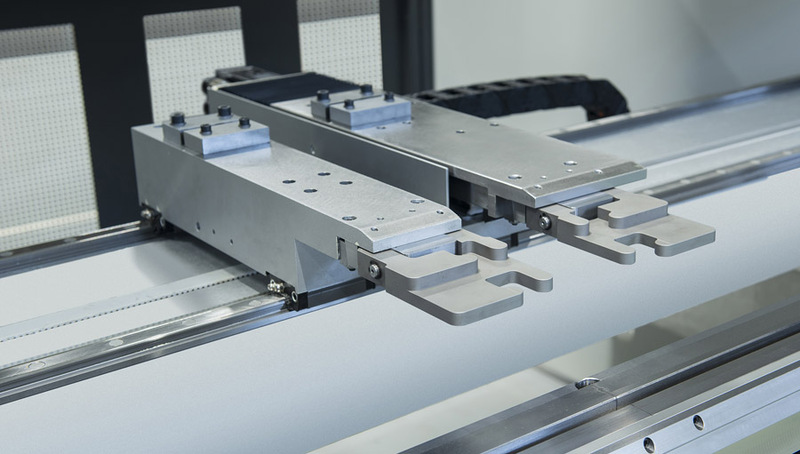 If the customer has more than one brand of press brakes on their shop floor (that can be programmed offline and connected to a separate computer via cable or a USB stick), they can look into systems such as those from Radan or Metamation. Hydraulic clamping: Reducing setup times can be one of the biggest opportunities for improving the flow of operations in a fabrication shop. If a press brake operator needs wrenches, shims or wedges to get the tooling to set properly, it’s a problem. With hydraulic clamping, however, operators don’t need to fiddle with the dies to make them fit. Setup times can be significantly reduced, allowing the operator to spend more time bending parts and keeping up throughput. For shop owners hoping to salvage their outdated equipment, hydraulic clamping is a good option as it can be added at any time. Companies, such as Wila USA, can do an assessment on a press brake to see if it’s a good candidate for upgraded clamping. Programmable crowning: Like hydraulic clamping, programmable crowning works without the need for shims or wedges that often need adjustments. It also works without creating banana or canoe effects, only producing straight bends. Also similar to hydraulic clamping, companies such as Wila can add programmable crowning to older models. Multi-axis backgauge: Multi-axis backgauge bending makes production of complex parts simple. Older press brakes have no backgauges at all or only one (the flange dimension) or two axes (the flange and finger height to match the die height). Today, however, parts are more complex to the degree in which 5- or 6-axis backgauges are strongly recommended. Malek says X1 and X2 axes are recommended in cases where the bend is not parallel to the part edge and Z1 and Z2 axes to position the fingers side to side. R or R1 and R2 are also helpful to have. As is the case with clamping and crowning, some older press brakes can also be retrofitted with new backgauges. Laser angle measuring systems: Technology, such as LVD’s patented Easy-Form Laser, was developed to allow lasers to measure the bending angle on the fly. When in use, operators can produce perfect bends every time. Therefore, operators with access to laser angle measuring systems see more parts coming off of their press brake thanks to bends that come out accurately the first time. Automatic tool changers: Like LVD’s ToolCell, an automatic tool changer press brake can save an operator an enormous amount of time. More often than not, tooling is strewn throughout a shop, requiring operators to waste time hunting down the dies they need. With an automatic tool changer, not only are all of the parts where they need to be, they also slide into place virtually without operator intervention. A complex part with 10 bends on three different stations, for example, only takes a few minutes to set up. With an automatic tool changer, complex parts only take a few minutes to set up. Regardless of the challenges of bringing a new fiber laser cutter in-house, the increased cutting speeds and ability to better cut reflective materials give fabricators a major competitive edge. Reduced maintenance and lower operating costs further punctuate the benefits that come from such an investment. As with any investment, however, it’s crucial to understand how the new equipment will affect overall operations. Look beyond the cutting stage of the manufacturing process, assess the age of and the technology available on the other equipment in the facility and work with professionals that can offer advice to avoid bottlenecks before they become a problem. While many older press brakes can be outfitted with new bending technologies, not all will be candidates. Therefore, it’s important to keep in mind that the investment in a new fiber laser may also require further expenditures – whether it’s new components or an entirely new press brake. In the long run, the benefits that come from the best equipment with the best technology will pay off in dividends.